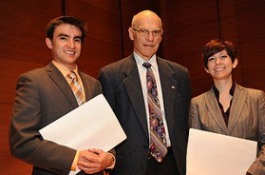 Two NanoCEL research team members were recipients of the 2012 Outstanding Graduate Researcher awards, which recognize full-time, thesis program students who have distinguished themselves in research, especially technical publication. Joseph Lessard received the award for Master's Level research, and Matthew Boucher received the award for Ph.D. Level research. 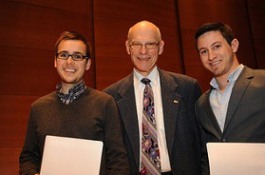 The Graduate Student Awards ceremony was held on Friday, April 27, 2012, 4:00 PM at the Perry and Marty Granoff Music Center's Distler Performance Hall.